The fabulous I.J tagged me for this cooking meme, which I'm sure my loyal readers will find hilarious. As you and I both know, the Monkey's kitchen is immaculate. Why? The Monkey doesn't cook! Well, here I go anyway. (1) What were you cooking/baking 10 years ago? N/A. 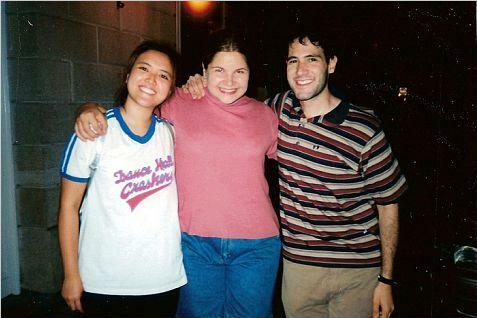 In 1997, I was senior in college, and I had the benefit of a dining hall. (2) What were you cooking/baking one year ago? I love all kinds of chips -- potato, corn, even fruit. If it's crunchy, I will eat it. Expensive and rare things like truffles. I would add truffles to everything. I would also eat Kobe beef and toro and all the time. In addition, I would fly from region to region to sample the freshest specialties directly at their source. (5) What do you bake the most? Frozen cookie dough and frozen flautas. I'm allergic to chocolate, so I avoid it most of the time. I also cannot eat certain berries, including blackberries, boysenberries, and lingonberries. These berries wreck my digestive track. (Strawberries, blueberries, and raspberries are fine. Weird, huh?) Finally, I cannot drink excessive amounts of milk. Too much milk does what berries do to me. I like that little blow-torch used to create the "brulée" part of crème brulée. They're common, but they're so great -- french fries. I would also require some kind of cheese at my last meal. Maybe I could have cheese on the fries. Ooh! Chili cheese fries. That sounds good. It may be gauche, but you can't deny it's delicious. I might as well have a giant burger while I'm at it. Oh, but wait. What about all of my mom's best dishes? Damn it. This is too hard. My last meal is going to be enormous. I have many happy food memories from college. When I wasn't sitting in the dining hall pretending to study and socializing instead, I would go out for more palatable food with a good friend of mine. He was the one who introduced me to a number of cuisines, including Indian and Ethiopian, and we had the greatest time during these dinners. This friend also happens to be one of the most hilarious people I know. Here we are with Calcetines Rojos. My college friend took me to quite possibly the fanciest meal I'd ever had at that point in my life at Aujourd'hui. He had been feeling really down about a number of things, so his parents told him to pick any restaurant in Boston and to take a friend on their dime. Yay for being that lucky friend! My friend nearly single-handedly introduced me to the magical world of eating out and eating well, and it makes me smile to think about these first experiences. Thanks to this friend, I became a much more cosmopolitan diner. I miss this friend dearly. I wish he didn't live so far away. I'm going to tag Kate, Leslie, Jolene, Sarah, and Sugar & Rice. Good luck! My last meal would be a multi-day feast. Eating out and eating well IS an art. Thus why I now live vicariously through Wemo's eating. i am so hungry right now. i should eat lunch and then do mine. Woohoo, I beat you by having THREE recipes I know by heart!!! I win! I win! flautas were a running joke on today's "ellen show". yes, i watch "the ellen show". nothing else comes on at 4.